My first purely acrylic painting, and so far, I like! Got a set of Liquitex Basics after hearing a rave review from Lisa at Lachri Fine Art. She does beautiful work, and her review and product comparison was one of the reasons I chose the Polychromos colored pencils (which I adore), so I thought it was worth taking a chance and seeing what those little bottles could do. I started with very watered down acrylic craft paints I had from many moons ago. This initial layer gave me the feeling of a watercolor background, and was lots of fun to do. Then the other night, I went back in with a palette knife only and three colors from the Basics set: Phthalo Blue, Cad Yellow Medium and Titanium White. I know abstract work isn’t everyone’s bag, but I’m really enjoying it. It’s a wonderful way to be expressive, to learn a new medium, and to really have fun playing with color. SO many wonderful colors in that set! Based on my (limited) experience, two thumbs up so far. I hope you have a wonderful week. I think I can smell Friday. It’s rich and warm and chocolate. 🙂 Peace. Your architectural stuff is amazing – that must be why you’re seeing buildings! Thanks, Nicola, so glad you enjoyed this. I’m finding myself drawn more and more to abstracts, as much as I enjoy representational work. I was thinking about a cruciform composition…..going through some “stuff” recently, been praying a lot – and really been drawn again and again to the cruciform, which is how this painting developed. Thanks again for your encouragement! ‘smiling’…. just won’t cut it; how about, OH My GOSH!! That is SO Awesome Laura!!! love the colors, the palette knife, and design. And you know what YOU did? I just might love it now….maybe I might have to give it a try??? Thanks very much, Rebecca! I hope to be doing more of these, and very soon. Your encouragement means a lot! Thanks for taking the time to look and give your feedback. Are you still working with acrylics? Thank you; I’m so glad you think so! It was really fun to do! Really glad you stopped by! Thanks so much, Charlie! It was so much fun slathering the paint on with a knife. I’ve decided to really branch out and try more acrylic work. Something I’ve never really been drawn to before, but I figure it’s worth a try, see where it leads. So far, really loving it. So glad that you’re so enthusiastic about this. I’ve been really very pleasantly surprised by the feedback I’m getting on this! Again, thanks! Yeah…I definitely think you should try more! I love the watercolor effect you got as well…very cool! I really need less chaos in my life to paint a lot. Things are always changing, so who knows what the future will bring? In the meantime, looking forward to your explorations! And thanks for the book info. You’re welcome. I know what you mean about chaos. I think chaos makes me paint more. Unless it goes way too far. I hope you’re not in that place. I have not yet been “settled” in my life…maybe it will never happen. But maybe it will. It’s not boring anyway. Thank you so much, Tori! I’ve always loved blue and yellow, and I knew from their names that they would be bold and make a statement, so I just went with it. Thanks so much for your feedback! I’ve been blown away by everyone’s generous encouragement this morning! I truly mean it, you have such a knack when it comes to colour combinations. I could just imagine this a huge canvas, it would look fantastic! Thanks, my sweet! Glad you do! Thanks so much, Kirk! I hope you’ll try abstracts again when you get a little free time. Hope you’re enjoying your semester! Laura–Thanks. It’s a bit grueling, to be honest. I miss drawing. I’ll keep you in my prayers, Kirk. I guess spring break is coming? Maybe you can get some sketchbook time in. Art is such a restorative thing. How freeing, Laura. I like you whole approach, dare to experiment! Thanks, Sharon! I’m all about experimentation. hehe. It is really freeing; you’re so right! That is a stunning abstract, Laura! ❤ I have a lot of full time artists friends who do abstract and your piece is as good as any of theirs. Oooh, yeah, I’ve been on (am still on?) that slippery slope. LOL! But, yeah, some loose w/c paper would be nice for things like this. Maybe you can cut it out of your book? I could, but it’s my journal, I make sure I cover at least one page a day – I go through one of those Visual MM journals each month. So there’s stuff on the back of each page also. I never know how something will turn out! Certainly didn’t have very high hopes for my first acrylic, it was pretty much a trial run. I have to say, I like the fact that if you make a mistake in acrylics, you can cover it up! Something I’ve never had the luxury of in WC. Yeah, may need to take the abstracts to a totally different book. Thanks, Teresa, for your encouragement (as always). I think it’s brilliant! Great work! Thank you very much! I’m blown away by the praise … and dying to do more of these! These are wonderful! Both of them. I would be careful with watering down acrylics, though, unless you’re ground is fairly absorbent (like unsiezed canvas or paper, or a good, chalky gesso). Watering down thins the polymer binder, and it may later have a tendency to peel free, especially if layered over other colors. 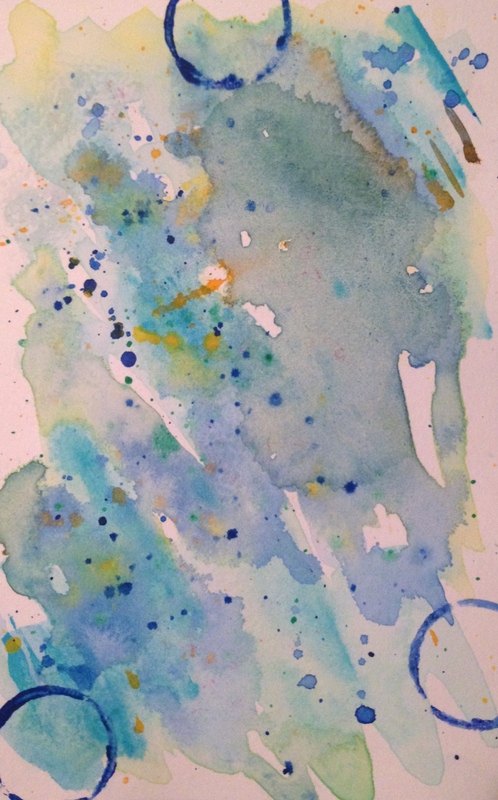 But you can still have those wonderful watercolor like washes! Just use a glazing medium, or gels, or some combination at something more than 50-50 with water. I only mention this cause you said you were new to acrylics–please forgive me if you know all this and I’m just being a busybody! Thank you so much! I really appreciate the tips. I know nothing at all about acrylics. Would an acrylic retarder also work to thin it down? That’s what I happen to have already. (Trying to avoid buying more stuff if I can help it) My other question is what if the watered down paint is the underpainting, and it’s on mixed media (90 lb cotton) paper? I guess it’s safer to water it down in that case? Really appreciate the help and I’m so glad you like this! It is a wonderful piece. I would think the underpainting on good cotton paper would be ok–as the pigments would be taken up by the fibers of the paper, like watercolor–which doesn’t need the gum Arabic binder once it’s laid down. With the web–it’s so much easier to pick up technical information when get started on a new medium or process. Here’s on link that says pretty much what I did in my comment. If you’ve tried using an all water thinned glaze over other colors, like you would do with oils thinned with linseed oil and turp–you’ll see right away what happens–the pigments come apart rather than covering in a smooth clear glaze. Dr. Google has an answer for nearly everything! Oh, what that linked article says about flow aid! If you want to make fine lines, like with a liner brush, even the liquid acrylics don’t flow off the brush like watercolor or ink. A few drops of the flow aid makes a huge difference! And cause you don’t use more than a few drops–it lasts a long time. Good for the budget. The medium goes a long way, too. 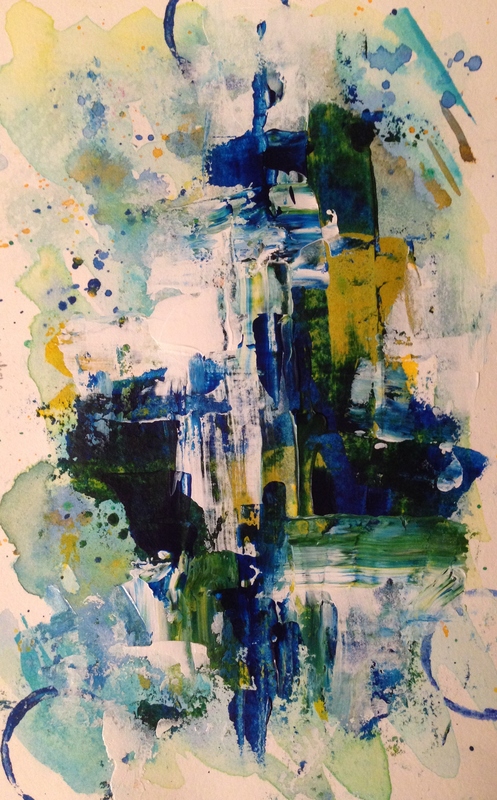 This abstract is totally amazing Laura, one of your best pieces! From the depth, to the design and work with the knife – it’s a piece with a lot of energy and personality. Very nice color choices. Lisa is a fantastic artist and teacher! Thank you so much, Mary! I hope it isn’t beginner’s luck, as I didn’t think all that much about it. Although I do think more and more, choices are being made instinctively, to some extent. I was thinking about you today, because I know you’ve tried many mediums too. I just can’t seem to settle down to one. I’m like a kid in a toy store; I wanna try them all! I would have written more but I was on my phone and so I conserve my typing as I am so slow at it and don’t plan to get any better, but still. Anyway, I really like this direction. As someone else said, you knew when to stop and not to muddy things up and so on. I think that’s very hard. Seems to me it’s all about balance, in doing abstracts, and in following the lead of what you have already put down on the paper, rather than working to some outside idea. I hope to see more of this! Another ‘wow’ for your well-deserved collection! These are truly brilliant, Laura – they’ve totally woken me up; last time it was the cat you did it to, this time it’s me! You’re on a roll 😉 I see something graphic-architectural in there somewhere – a real treat to look at! Thanks so much, Jacob! Wow, I’m so blown away by the gracious feedback I’ve had all day on this painting. I’m really stunned and so pleased; you can’t imagine! You know that “fly around the room” feeling? It’s been so cool. So glad to hear that this painting brought you to life, although who knows, maybe another bird at some point here soonish may get your cat to take notice once again. (Loved that when you mentioned it!) Have a great night, my friend 😀! Ha ha, I’m hysterical when a post gets a handful of nice comments; I don’t think I’d be able to handle the amount you’re getting! And indeed, anything that keeps Oscar occupied (or rather, out of trouble) would be very much appreciated! He’s nearly eighteen but still a mighty handful!!! I’m sure; aren’t they all! Thanks Jacob! WOW! I really like both of these! The color palette, the shapes, patterns, the negative space all work for me. I’m not really into abstracts but these I really l like. I’ve been looking at them for minutes before commenting. I don’t know how to put into words what I like about them, but I like them! Thanks, Deborah! I’m glad that you do! I’ve been really surprised at the encouraging words so many have given me on this painting. Really blowing me away. Abstract work is really an exploration of what’s inside of me and maybe that’s why I’m drawn to it? Not sure, but I love to play with color and it suits me at this point. Keep it up. You’re creating wonderful art. Thanks, Ann! So glad you like! I really don’t think acrylic is my medium, can’t imagine painting anything realistic with it. I’d think that would be extremely hard to do! But I do like the fact that you can cover up things in acrylic. Much better than WC in that sense. So glad you like! Oh, that’s really cool! Maybe that’s why my husband liked this one hehe. He has always enjoyed the space program and is totally fascinated by it. He doesn’t normally like abstracts, but he liked this one! Glad you do too! I love it! I never thought abstract painting would be my thing but I now I am hooked. Sounds like you may be too! LOL! Tell Hubble thanks for that note. Wags & hugs to him! hehe I’m really glad you like this. I actually have another abstract posting at 530pm Eastern today. It’s much busier tho. I’ll be curious what you think! We all are cluttered wth too much precise images, Abstract art enables the viewer to perceive beyond the tangible, and experience the workings of color, line, and form. It can lift you to a higher form. And as my eyes travel over your painting, the visual components bounce off each other and harmonize an energy of motion. Laura I very much like your painting. Art worth framing. all visual art is abstract. What a viewer brings to the work.. planted as iconograpy, or free associations, belongs to literature, to semiotics, to language… the stuff you talk about when you stop looking. All of that.. the stuff you talk about and think about.. when you stop looking. The visual art is in the visions… in the looking and receiving beyond and beneath word-language. A visual artist–even if they do so so-called representational work, works on a level beneath and apart from word-language. If all that’s left of a work when you see it.. is words. It’s not visual art. It’s something else. I will do my best. I really love it, but I have a lot to learn about composition and depth. I really enjoy abstraction tho. Thx for the comment and the follow. I’m sure your work will inspire me! An overgrown castle, on a floating island (or really high up), with a waterfall flowing out of the top. Hey I wanna live there too, now you’ve described it like that! Thanks, Jesse!